​The pantheon of gods from Ancient Greece was extremely large, and as a result, today it is mostly the main gods who are recognised. That being said, modern reworking of ancient tales, have ensured some minor deities from Greek mythology have become prominent, with one such god being Triton. The name Triton today is normally associated with the character from Disney’s The Little Mermaid, where Triton is the king of Atlantica, and father to the main character Ariel. Although the story is taken from a Hans Christian Anderson fairy tale, the actually origins of Triton can be found in Greek mythology. most famous of these deities is probably Poseidon, but other major sea gods included Oceanus and Pontus, and it is within the pantheon of sea gods where Triton is to be found. Triton, in Greek mythology, was the son of Poseidon and his Nereid wife Amphitrite, and was commonly believed to reside with his parents in their golden palace beneath the surface of the Aegean Sea. Triton would act as the messenger for his father. As a messenger of Poseidon Triton would ride on the backs of creatures of the deep to quickly carry messages to all parts of Poseidon’s domain, but Triton also had the ability to ride the waves themselves. Typically, Triton was depicted as a merman, with the upper body of a man, and the lower part being the tail of a fish; indeed the name Triton would often be pluralized and used as synonym for mermen and mermaids, although Tritons were often considered Satyrs of the sea. Triton would often be seen carrying a trident, a three pronged spear, similar to the one carried by his father. Triton was also normally depicted carrying a twisted conch shell. The shell was used by Triton as a trumpet, and had the power to both calm the sea’s waves, but also to bring them to a frenzy. 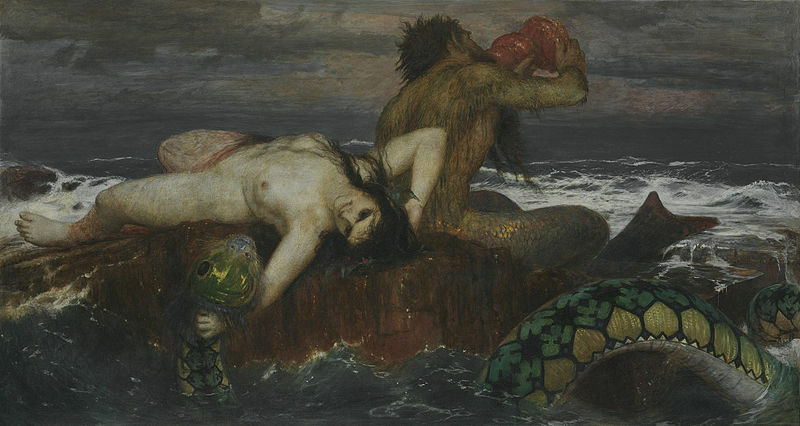 Triton was father to Pallas, the nymph of Lake Tritonis, as well as foster father figure to the goddess Athena. Pallas, the daughter of Triton, and Athena were raised as sisters but were highly combative, and would often duel with each other. During one bout, Athena accidentally killed Pallas, and in honour of her dead “sister”, Athena took on the epithet Pallas. 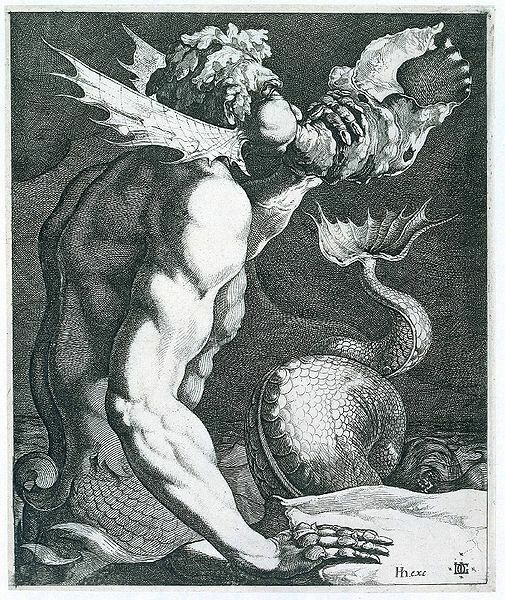 Triton appeared only occasionally in mythological tales, but famously does help Jason and the Argonauts, directing the Argo and its crew back on course after it had become lost and floundered in marshland. Triton also appears in the Aeneid (Virgil) when Misenus, the trumpeter of Aeneas, challenges the son of Poseidon to a contest on the conch shell. Mythological tales though were clear that it was never wise to challenge a god, even if it was a minor one, and the contest never even took place, for Triton threw Misenus into the sea.